I have been quite derelict in my duties to this blog and to correct this, I am doing what I would call ‘interesting stuff’ dump on my long-suffering readers. Also, the photos in this post are few and paltry. I had to take thems without flash and also surreptitiously. And there was also that stupid 2 MB limit per pic. First, of book clubs, specifically my last one on October 4 at a beautiful home in Mission Viejo with an amazing group of women, all of them, including the hostess, movers and shakers at our largest hospital and trauma center in our area, Mission Hospital (run by the Sisters of St. Joseph of Orange). It is amazing how each group I meet has a different take on THE DEATH OF RAFAEL, on the protagonists and the story. The discussion was lively, erudite and fun in spite of some of the darker themes in my novel. The one comment that resulted in a big laugh was that my love scenes were too short. “Only two sentences!” I had to explain that I find it difficult to take love scenes seriously and that I have the unfortunate habit of seeing the comical side of them. We also had great fun figuring out which actor should play which protagonist. Clooney and Banderas. Daniel Craig was selected for von Klaussen. I don’t recall if anyone talked about the women in my novel. This Sunday, October 20, Kateri Tekakwitha, in one of those magnificent ceremonies in Rome, was canonized, the first native North American to be declared a saint. She was born in 1656 in the area that is now New York State, the daughter of a Mohawk chief and an Algonquin woman. She contracted smallpox when young, and while she survived it, she was partially blinded by it. She died at the age of 24, and was known as the lily of the Mohawks. She is now the patron saint of Canada and of the Native Americans. Because indigenous people in the San Juan Capistrano area had such an important and immense contribution to the building and life of the mission, and because Kateri Tekakwitha has been for many years invoked in the basilica (she is part of the great retablo brought from Spain), on this Sunday there was a special ceremony in parallel with Rome. 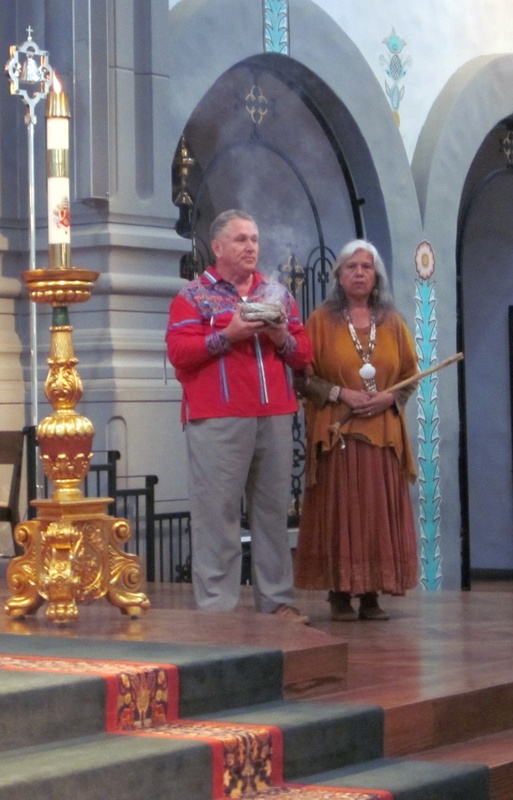 The ceremony at the San Juan Capistrano basilica was attended by the descendants of the Native Americans who had built this mission, the Acagchemen people, but now known as the Juanenos. 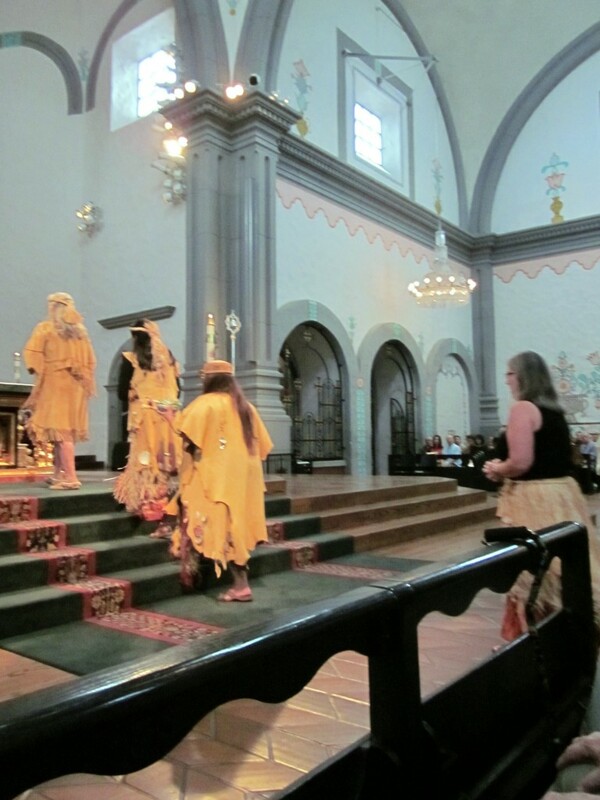 The ceremony started with traditional Juaneno blessing, prayer and then invocation of the four winds. By coincidence, that same evening the Basilica had the dedication of its new, absolutely fantastic organ, followed by an amazing concert by the great Argentinean-born maestro of the organ, Hector Olivera. To display the organ’s full range, he went off the program and in addition to Bach and Handel, there was even one of Astor Piazzolla’s great tangos, where the organ actually produced the sound of the Argentinean bandoneon. As a lover of organ music, I was somewhere between the upper reaches of the galaxy and tears. But when the concert ended, it was not over. Members of the audience stayed long after to chat, admire the organ and ask questions. 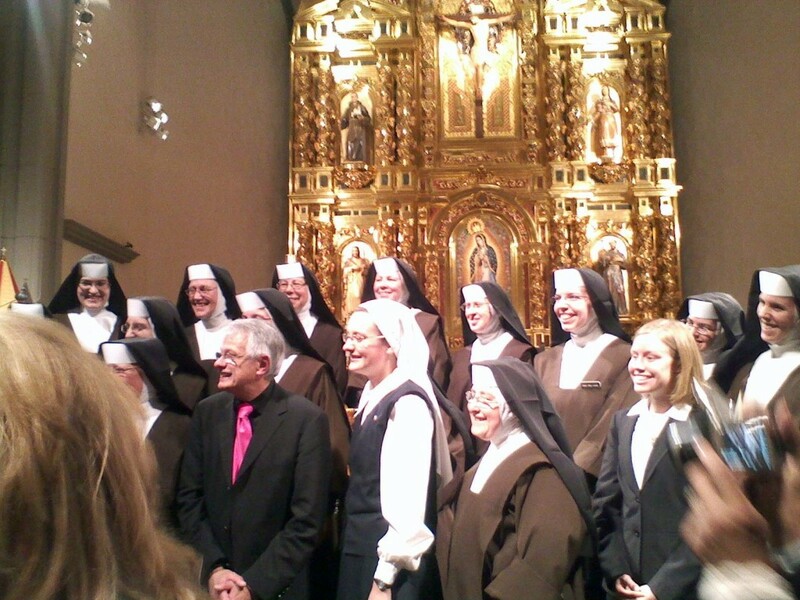 And then, a group of Carmelite nuns who had come to hear the music, gathered on the steps to the altar and the Olivera accompanied them in an impromtu choral piece. I don’t say this lightly, but it did sound like celestial music. This entry was written by admiNWD, posted on October 24, 2012 at 4:37 pm, filed under The Writing Life. Post a comment or leave a trackback: Trackback URL. Excellent blog, worth waiting so long for it! Thank you for sharing all these wonderful stories and events.